Standing on a New York City subway platform in 1980 and seeing a slow moving train, close-up, emblazoned with colorful seven-foot tall letters, characters, and images moving past created an overwhelming and wondrous experience. 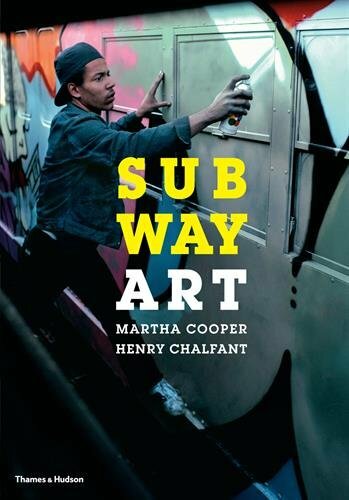 Subway Art, by photographers Martha Cooper and Henry Chalfant, is a revisiting of that experience while providing a deeper understanding and wider context of an urban art that has become unstoppable in the past 30 years. Back in the 1980s much of the New York subway riding public found graffiti shocking, invasive, and offensive. Most did not know what to make of it. The signature black marker graffiti jumbled upon itself in the interior of subway cars became an example of the breakdown of social order and urban blight that was center stage in the south Bronx. But the exterior of the subway cars, painted with wall-sized 50 foot long eye-popping color-intensive murals were another story. They went beyond narcissistic vandalism to display exuberance, artistic sensibility, and much talent. The sheer determination to design, plan, and execute public murals on trains on such a large scale was impressive regardless of what one thought of the painter’s motivation. Since then graffiti has flourished into a universal urban art and worldwide phenomenon that can be seen from the neighborhoods of Brooklyn, to London, to Melbourne, Australia. Martha Cooper, who began as a photojournalist, and Henry Chalfant who worked as a fine art sculptor in 1973, witnessed and documented the “art” movement independently at the moment of its birth, when most museum’s and critics thought the work a destructive influence upon society. Cooper’s photography tended to place the subway art in its greater context by showing train stations and environment, while Chalfant’s view was to see each car as an isolated unique and evanescent work of art that stood on its own. The book is replete with both types of photographs giving a varied combination, and includes over 70 new photos not included in the original printing. Subway Art is a soft-cover, updated, and expanded version of the hardcover photo book first published in 1984 by Thames & Hudson. The images of this large book (9.3 x 13.3 inches) are expertly printed with solid blacks and vibrant Kodachrome colors that fill virtually every one of the 128 pages. The book contains fascinating interviews with both photographers as to how they became involved with subway art, as well as an insightful essay by Henry Chalfant regarding the consequences of being graffiti artists. In the 1980s the majority of subway graffiti artists or “writers” as they were called in New York City, were either Latino or black teenagers. Graffiti was viewed by law enforcement and other authority figures as an “entry-level crime” and vandalism. Perpetrating such an act opened up the artist to dire consequences, as in the death of Michael Stewart in 1983. Stewart was a 25-year-old black man who had been arrested for spray-painting graffiti and died in police custody. Chalfant’s essay goes on to update the various artists and their careers that followed, and provides historical context to what has become a global art movement. While the book is not an exhaustive survey of the history of the graffiti movement it is a fascinating source of material for those interested in visual anthropology and the impact of a developing urban art and social language.